Gorgeous fluffy pink flowers and delicate mimosa-like foliage. This exotic, deciduous tree comes to life in late-spring with the emergence of wonderful, fern-like foliage – and reaches a crescendo of colour in mid-late summer when the incredible, fluffy, bright pink flowers cover every branch – each one carrying a lovely fragrance! Hardy enough to withstand all but the worst frosts, it is ideal for a pot or sunny border. Ideal as a feature plant in Mediterranean-style gardens. Can reach 8 x 4m in 20 years, supplied as an established plant in a 1L pot. This exotic deciduous tree comes to life in late-spring with the emergence of wonderful, fern-like foliage – and reaches a crescendo of colour in mid-late summer when the incredible, fluffy, bright pink flowers cover every branch – each one carrying a lovely fragrance! Hardy enough to withstand all but the worst frosts, it is ideal for a pot or sunny border. 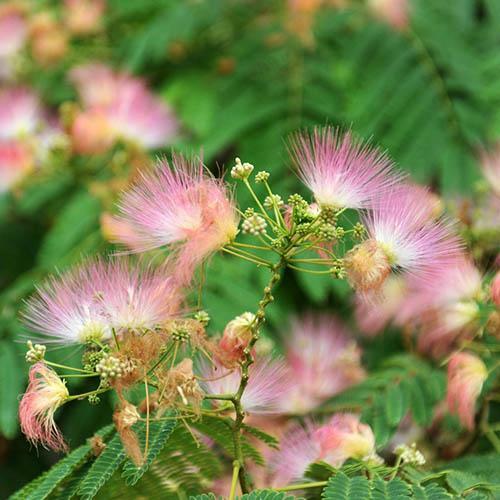 Also known as the Persian Silk Tree, Albizia is ideal as a feature plant in Mediterranean-style gardens, where the fine foliage makes a particulalry attractive feature in its own right. Hardy throughout most of the UK, the silk tree benefits from planting near a south-facing wall for a little winter protection, helping it to retain its leaves for a little longer into the autumn. Reaching up to 8 x 4m in 20 years, you will recieve an established young plant in a 1L pot. Supplied as an established plant in a 1L pot. Caesaplinia is easy to care for and generally problem free - plants grown under glass may need a restrictive prune after the first flush of flowers. Otherwise, prune silk trees in winter or early spring, reducing the stems to fit the available space, and removing any dead or damaged branches entirely.